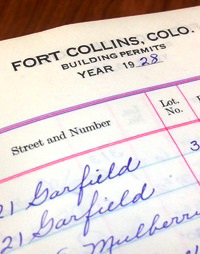 Through the three sources described below, researchers can access online Fort Collins building permits dating from 1920 to present. One building permits book located in Special Collections box BP-1 at the Fort Collins Local History Archive covering the years 1920 through 1949. Multiple building permits books located at the Fort Collins Historic Preservation Department covering the years 1920 through 1956. Second, permits from 1956 to present are scanned and searchable online through CityDocs, the City of Fort Collins Public Records portal. Finally, permits from 1983 to present are searchable through the City of Fort Collins Citizen Portal. There is some overlap between this database and CityDocs.